If you set people free, empowering them to make their own decisions and define their own work as knowledge professionals, you need good policy for their sake and yours. If you set someone free in a field they need to know where the boundaries of the field are. 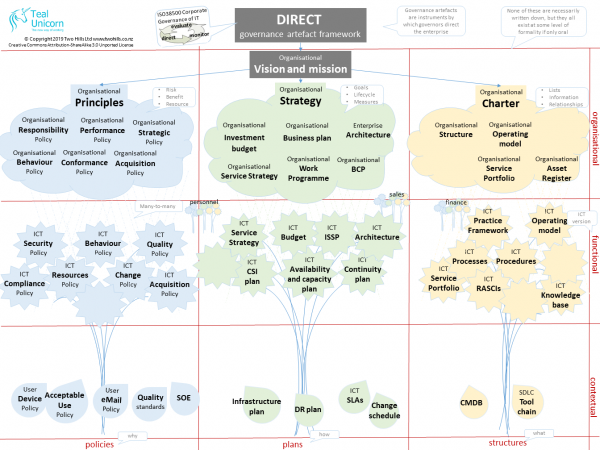 Direct is Teal Unicorn’s policy (“governance artefact”) framework. The name comes from the three functions of governance defined by the ISO/IEC 38500 standard , which are direct, monitor, and evaluate. It also plays on the pun of “direct” as both a verb and an adjective. Years ago we looked for a framework which could be used in an enterprise to ensure completeness of policy and we came up empty-handed, so we have developed this framework which also embraces the hoshin kanri methodology to ensure that the policy flows adequately through the layers of the organisation, and that feedback is passed back to improve policy. The Organisational layer informs the Functional layer, where policy, plan, and structure artefacts are created specific to the various domains of the organisation, such as Sales, IT, Personnel, Finance, and so on. These artefacts should be local elaborations of the Organisational governance, referencing it directly, and not contradicting it. The Contextual layer provides even more localised governance artefacts to collect, elaborate, and clarify Organisational and Functional governance in specific contexts, such as hiring employees, claiming expenses, dealing with suppliers, or using the internet.